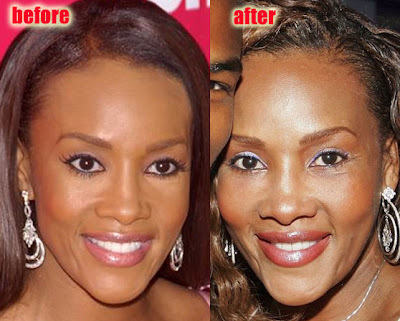 Vivica Fox before and after plastic surgery. Vivica Fox sure is looking mighty different these days, so lets take this opportunity and play everyone's favorite plastic surgery game, "What in the world, happen to her face?". Contestant #1: Did she have an eye lift and cheek implants? Contestant #2: I bet she had a chin implant and a brow lift! Contestant #3: She clearly went the whole nine yards and got a full blown facelift! Well, unfortunately there are no real winners on "What in the world, happen to her face? ", just tears, glasses full of salty tears. Now all we need is a "flux capacitor" so we can stop our beloved Vivica Fox from ever venturing into the world of plastic surgery. Remember her dreadful breast implants? We can save those too! It's called aging, and weight gain... She looks great for 46. Try looking at some of the other celeb photos 15-20 years later. African American women age rather well I must say, and plastic surgery is not needed, but others always seem to think we have had some work done. Stop hating on the natural beauty.